Wanna Go into a Cookie Coma?! 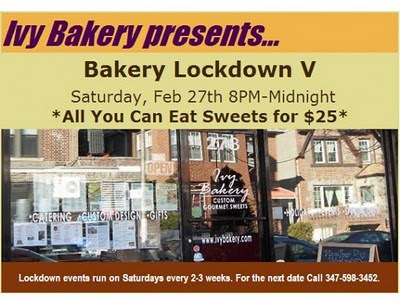 Locked in the Ivy Bakery with unlimited cookies, cakes, and cupcakes, oh my! With the summer sneaking up on us slowly but surely, that's just mean! Especially since they have an event at least once a month! If you don't care about getting bathing suit ready, you can check out the lowdown on Socially Superlative's Blog. If you go, tell me how it is, but make sure I'm already full before you start divulging the mouth-watering possibilities!